Use the Granada airport car hire price comparison website tool below to quickly find the cheapest car hire for Granada airport in Spain in just seconds. The free price comparison search engine below will compare all the current Granada airport car hire deals and car rental rates to give you the lowest and cheapest car hire for Granada airport. It is free to use – just put in your dates for your car hire Granada airport and tell us what type and size of car you want to hire – then let the price comparison booking engine do the rest! Before you start searching for cheap car hire Granada airport, note that you must be at least 21 years of age and have held a full driver’s license for at least a year. Granada Airport is a small regional airport servicing the Costa del Sol, and the nearest international airports are Malaga Airport which is 117 kilometres away and Almeria Airport which is 175 kilometres away. Granada has a very limited service offering flights between the United Kingdom and the city and currently only Ryan air offers regular services from Liverpool and London Stansted to the city. 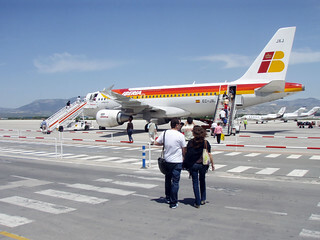 Granada Airport is the gateway for winter sport tourists coming to hit the slopes of the Sierra Nevada. Pradollano is Europe’s most southerly ski resort and although small in comparison with ski resorts elsewhere, facilities are considered to be first class. Of course there are also the sea side resorts of Nerja and Torrox less than thirty minutes away by car and one has the possibility of skiing in the morning and sunbathing on the beach in the afternoon. Granada itself is famous for the Alhambra Palace which is a Moorish castle and citadel and because of its Islamic heritage Granada is a cultural and tourist hotspot with thousands of international visitors annually. You can see live images of Granada right now on our Granada webcams page. Granada Airport has no rail links and the bus service is limited. Taxis are more expensive than a private Granada transfer so the easiest and most economical way to travel from Granada Airport is to hire a car. WHAT CAR HIRE COMPANIES ARE LOCATED IN GRANADA AIRPORT? There are four main car hire companies which are represented in the terminal building of Granada Airport which are Aurigacrown at Granada Airport, Avis at Granada Airport, Europcar at Granada Airport, Goldcar Europa at Granada Airport and Solmar at Granada Airport. WHAT DOCUMENATION DO I NEED IN ORDER TO HIRE A CAR FROM GRANADA AIRPORT? To rent a car at Granada Airport a full United Kingdom drivers licence and passport must be presented on collection of the vehicle. Depending on the car hire company one has made the car rental booking with, the car may already have a full tank of petrol or diesel and will expect the cat to be returned fully tanked up as well. Some car hire companies will give the client an almost empty car and expect it to be empty on its return as well. It is more economical to rent a car by the week as opposed to a daily rate. Included in a weekly car rental are insurance, theft and damage waiver as well as unlimited mileage. Most companies will charge extra for roof racks, and car seats so it pays to shop around for the best rates and secure a vehicle. Granada car rental companies have cars to match all budgets and size requirements from small economical vehicles, to mid size and compact vehicles, people carriers to mini vans and luxury class vehicles as well. 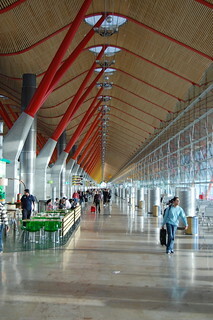 Photo above is of the terminal building at Granada airport. Aurigacrown has a reputation of having nearly news cars no older than six months to eight months in their fleet with over 40 different models to choose from ten different manufacturers. Rates start from as little as €58 a week including a full accident insurance and free booking modifications. Cars one can choose from include a mini Peugeot 107, a Peugeot 207 or Ford Fiesta in the economy size, Toyota Auris, Ford Focus and Volkswagen Golf in the compact size, Citroen Berlingo, Renault Scenic and Toyota Avensis in the intermediate size. Mini van rentals include a Volkswagen Touran, Ford galaxy and Mercedes Vito while luxury cars include a Mercedes E Class. Avis always has special offers and discounts. Motor vehicles to choose from in the economy range include the Fiat 500 and Seat Ibiza, medium compact Seat Leon, medium intermediate Audi A3, small people carrier Opel Zafira, standard people carrier Volkswagen Passat and large people carrier Audi A4 Avent. A medium intermediate car includes the Mercedes B Class, large executive cars include Audi A4, Audi A6, Large people carriers include the Mercedes Viano and large cars include the Mercedes E class while minibuses and vans include the Grand Chrysler Voyager and Mercedes Vito. Rates for November start at €120 for the week. Europcar accepts cash, cheques and credit card payments accompanied by identification. Cars to choose from include the Seat Leon, Fiat Linea, Renault Fluence, Volkswagen Touran and the Seat Alhambra. Rates start at €195 for a week from mid November. Goldcar Europa has very good rental rates if booked early. Rates start from as little as €65 a week. Group AA cars include a Ford Ka 1.3 and can be booked from €77.28 a week during the month of November. Group CC cars include a Ford Fiesta 1.4 from €87.69 Group D cars include a Citroen C4 Picasso from €109.89 for a week. Group E cars include a Ford Focus costing € 98.79 a week. Group F cars include a Ford Focus Estate 1.6 for €104.34. Group I cars include a Ford Galaxy for €237. 54. Group J cars include the Opel Zafira for €215.34. Group K cars include a Mercedes Vito for €254.19 a week. Group L cars include a Ford Focus C Max at €104.34. Group R cars include a Ford Fusion for € 86.24. Group S cars include a Citroen Berlingo from € 88.48. Optional extras include car seats for €4 a day extra drivers €3 a day and inexperienced drivers under the age of 25 or having a U.K. drivers licence for less than 4 years pay an additional €2 a day supplement for a maximum of 14 days. If one is staying in Granada and you choose to rent a car locally to explore the Costa del Sol and the Costa Tropical then you can also hire a car in Granada itself. Local companies in Granada where one can hire a car for a day or a week include Hispacar, A&A Car Rentals, Archie Auto Rentals, Azar’s Rentals, B-Parkey’s Car Rentals, B. Thomas and Sons Rentals & Apartments, CG Rentals, David’s Car Rentals, Dab’s Car Rentals, Fas Car Rentals, Francis Rentals, Gabriel’s Car Rentals, Grenada Car Rental, Hetsels Car Hire, Indigo Car Rentals, J & B Auto Rentals, Maitlands Motors Sales and Rentals, McIntyre Bros. Car Rentals, Reggie Car Rentals, Roc Rentals, Rodney’s Car Rentals, Sanvics Car Rentals, Thomas and Son Rentals, Vista Rentals and Y & R Car Rentals. For peace of mind should one need to cancel a car rental after having made a booking then most Granada car hire companies will offer the client a full refund.